Winter has finally settled itself in the Grand Valley, bringing joy for some and misery for others. Unfortunately, my luck typically guarantees me the latter. In the day, our roads are wet with rain or snow. And at night, of course, temperatures are undoubtedly below freezing. I hope I don’t surprise anyone by saying that wet roads mixed with freezing temperatures typically turns to ice by sunrise. Being that I have only been driving a year, I am not the most experienced in winter road conditions. I tried to heed my mother’s words for a little bit. Everyone has been told something along the lines of “You need to drive slow.” “Winter is no joke.” Etcetera. November and December I did fine, driving slowly when the weather happened to be bad, although it hadn’t ever really been ‘bad.’ And then there came a big storm in January. Naturally, I was both scared and not scared at all to drive in the snow. And, as it turns out when you live within city limits, you become spoiled with roads that are cleared almost as soon as they get bad. As soon as you get out of the limits, however, it becomes a different story. There is ice everywhere, with snow packed on top of the ice in some places. And one clueless high schooler still cruising along as if nothing could happen. I almost made it to my destination. I had music on and was happier than ever. It was that final turn when I didn’t give myself enough time to stop and make that ice-covered right hand turn. 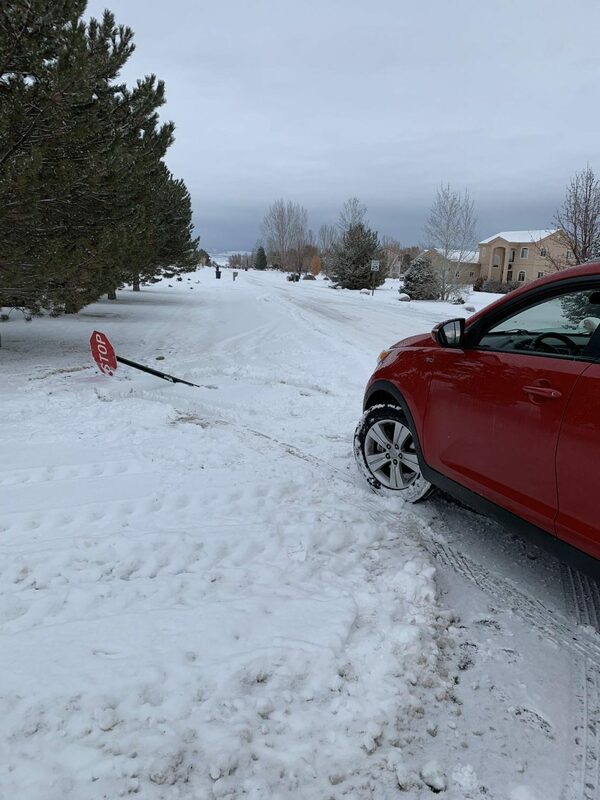 My car slid, and the front end rammed right into a stop sign. The entire sign fell over, I was in a ditch, and the whole thing took about two seconds. My car had to be pulled out of the ditch I had slid into. The moral of the story, however, is this: SLOW DOWN! You can never go slow enough when driving on ice, snow, and other various road conditions. According to SafeWinterRoads.org, “1,300 people are killed and more than 116,800 people are injured in vehicle crashes on snowy, slushy or icy pavement annually.” There are three general, well-known tips to drivers who aren’t looking to be a part of that 116,800: stay alert, slow down and stay in control. Those should all be heeded by the students of Fruita Monument as we make it through the last, and typically worst, months of winter.